Bioenergy research is translated into practical know-how by extension educators, farmers and Master Gardeners. 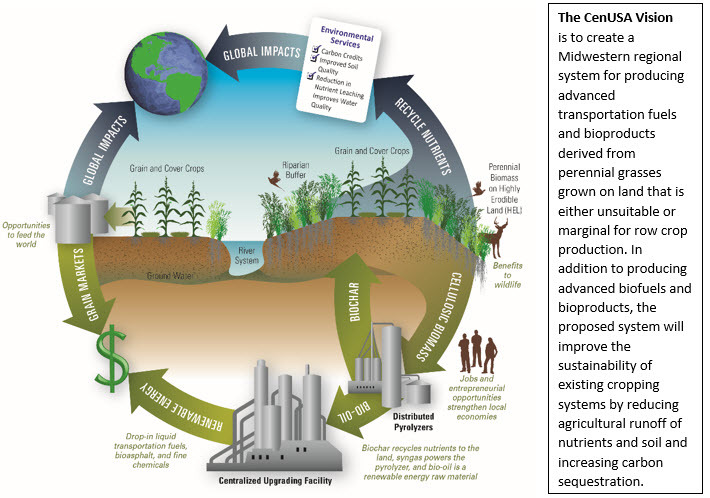 On the streets, in the fields, and online, the CenUSA Extension and Outreach Team collaborators deliver programming and educational materials critical to the CenUSA Bioenergy vision. 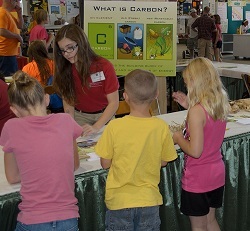 The mission of the Extension team was to help farmers and others learn about the environmental impacts of perennial grass production and utilization of biochar, best practices for growing and supplying perennial grasses for the biofuels/bioproducts industry, potential markets that may develop for the grasses; and to help farmers evaluate how grasses might work in their operations once a market develops. Accomplishing this mission was a team effort led by Project Co-Directors Jill Euken and Sorrel Brown from Iowa State University, along with 33 collaborators from seven universities and volunteer Extension Master Gardeners from Minnesota and Iowa. Under the direction of professional scientists and their institutions, citizen science projects amplified the impact of the CenUSA program. Farm demonstration sites and garden research plots provided hands-on learning opportunities for participants and produced valuable research data for CenUSA to share with the public. Extension and outreach professionals and farmers in Indiana, Iowa, Minnesota, and Nebraska established nine on-farm demonstration sites. Farmers established plots, collected data, and shared information with others at field days. Extension agents provided guidance, organized the field days, tours of plots, and informational meetings, which eventually reached more than 5,000 agricultural producers, consultants, and agricultural industry leaders. University of Minnesota Extension and outreach professionals and Extension Master Gardener volunteers established five citizen science research garden sites studying biochar (a charcoal like co-product of pyrolyzing biomass for energy production) as a soil amendment. More than 7,000 people visited the sites and/or participated in educational programs, and exhibits. Citizen Science: Master Gardeners in MN and IA conduct biocar research. Faculty and student interns at Iowa State University combined forces to create C6 BioFarm, a robust suite of STEM materials, for middle-school-aged youth. 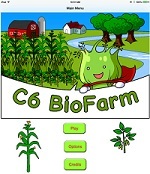 C6BioFarm includes an iPad app, supporting curricula and an iBook. These materials are available online to teachers and other youth mentors, such as 4-H and FFA leaders. C6BioFarm underwent two pilot tests, reaching 350 and 330 youth and adults respectively. The C6 program has been used by more than 2000 people. Education efforts by Extension and outreach were not without challenges. Most notable was the lack of an established market for perennial grasses – due to lack of commercial facilities to process the grasses and depressed fossil fuel prices. Without biomass markets, it was not possible (in fact, it was unethical) for team members to encourage farmers to transition acres to production of perennial grasses. The Extension team overcame this challenge by focusing on helping people understand that markets could develop. The easily accessible educational materials generated by the project team will help farmers, industry leaders and Extension and outreach professionals move rapidly to produce perennial grasses once a market for them opens up. Working with CenUSA scientific researchers, the Extension team developed an in-depth portfolio of online educational materials, providing science-based information in easily understandable terms. Publications include decision support tools, fact sheets, research summaries, and videos. 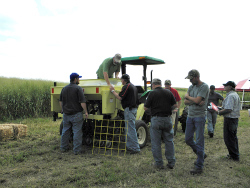 These educational materials will help producers, industry leaders, Extension and outreach professionals proceed quickly to produce perennial grasses when a market for them becomes more widely available. These materials are available at eXtension.org, the CenUSA web site, and CenUSA’s video sites (https://vimeo.com/cenusabioenergy and https://www.youtube.com/user/CenusaBioenergy). Amy Kohmetscher, Distance Education Specialist, Agronomy and Horticulture, University of Nebraska-Lincoln.